I wore this outfit twice recently, once with and then again without my felt hat. I have featured it previously here on the blog, but my felt hat is this one from J.Crew Factory (J.Crew Factory felt hat), but there are only a few sizes left, so I also found an identical hat for under $40 here. In the past I have stated that I am trend-phobic. My shopping budget is not unlimited, & I always want to make sure that my new purchases will work for me in many ways, for many years. 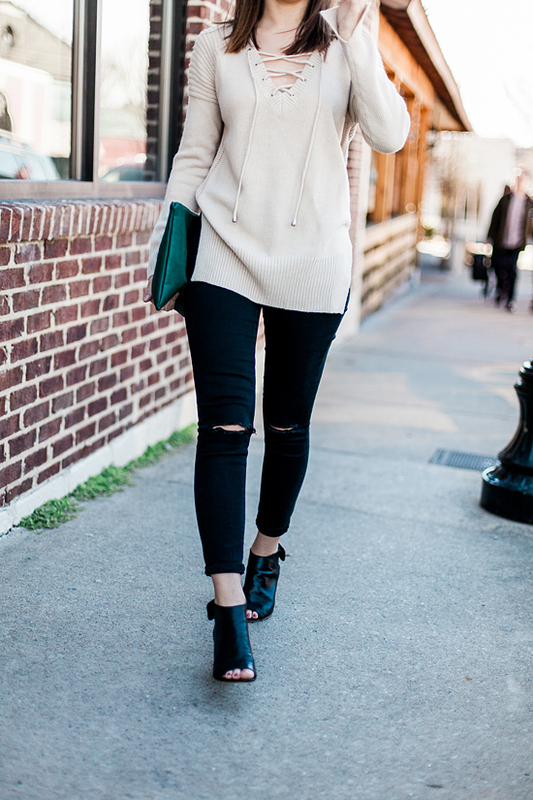 When I spotted this sweater, I knew it was finally time to try my hand at the lace-up trend. This sweater works for me because besides the lace-up detail, it is exactly in my wheelhouse of style - neutral color + long length that can be paired with slim bottoms (my go to silhouette is oversized top + slim bottoms). This ensures that my new sweater will be worn even after the lace-up trend fizzles out. 1. Baby steps. You don't have to try every trend at once. 2. Just because it is trendy, doesn't mean it should be cheap. This sweater was relatively inexpensive (snagged it using a 50% discount code that I got for signing up for the Tobi newsletter), but it constructed using high quality details & materials. 3. Make sure that you would want to wear the item even it is wasn't the hot hot item. This sweater is gorgeous & my style, meaning that it won't get donated after only 1 season. How do you try out trends? Anyone else fallen in love with the lace-up details popping up everywhere? ?